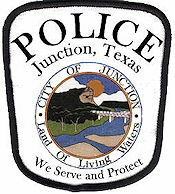 The Junction Police Department provides 24-hour protection to the citizens of the City of Junction, as well as the countless travelers and visitors that pass through daily. The Department is made up of the Chief and four full-time police officers as well as six reserve and part-time officers. The entire staff works hard to ensure that Junction is a safe and friendly place to be. The City of Junction is a drug free and equal opportunity employer. Copyright (c) 2013 City of Junction, Texas All rights reserved.